StoreHippo offers the functionality of wallets in all its stores. Wallets are basically kind of payment method in form of reward/cashback points that can be used by the customers while placing an order. Wallet points can also be added by the admin in form of refunds to the customers. Refunds: Wallets are used to get store credit when a user returns an order. User registration: Wallet points are given to the users to provide rewards on customer/user registration. 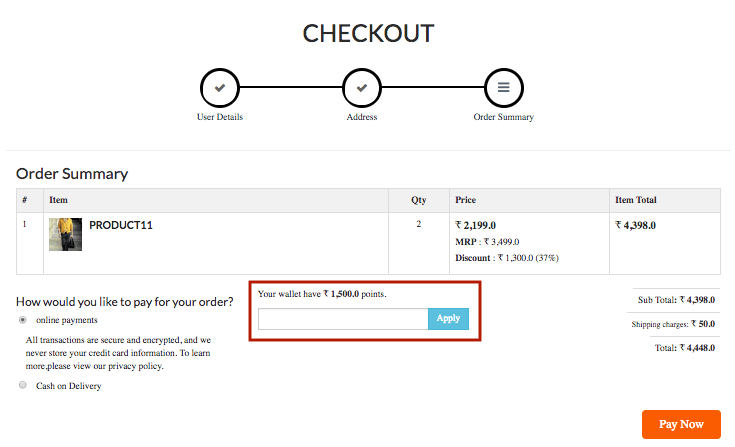 Product purchase: Wallet points are given to users to provide rewards when they purchase the specific product(s). Store credit wallets are enabled by default in all the stores. When a user returns something, they get the credit added to store wallet for future use. The loyalty program is a rewards program to offer special sales coupons or free merchandise, reward points and cash backs to customers. To enable the loyalty wallet, you need to install the loyalty app. You can keep track of and manage all the wallet transactions performed to and fro by the user/customers. You can also check and add points to the wallet of the users through wallet transactions section. Click on More Variables in the Design section. Go to the Miscellaneous and scroll down to find show wallet variable. 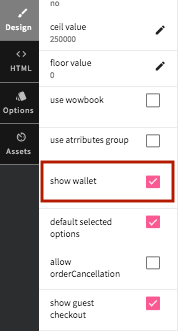 Select the show wallet checkbox to make the wallet visible in your store.